Gibb at the meet-and-greet after the Dubai Jazz Festival on 1 March 2008. 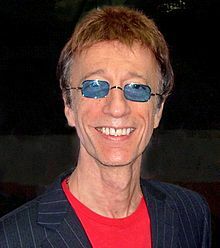 Robin Hugh Gibb, CBE (22 December 1949 – 20 May 2012) was an English singer, songwriter and record producer, best known as a member of The Bee Gees. Gibb gained worldwide fame with his brothers Barry and Maurice Gibb. Their younger brother Andy Gibb was also a singer. Gibb died of colorectal cancer in London, England. ↑ V. Bogdanov, C. Woodstra and S. T. Erlewine, All Music Guide to Rock: the Definitive Guide to Rock, Pop, and Soul (Milwaukee, WI: Backbeat Books, 3rd edn., 2002), ISBN 0-87930-653-X, pp. 85-6. ↑ "Bee Gees on AllMusic". AllMusic. Retrieved 27 September 2014. ↑ Summers, Kim. "Robin Gibb". Allrovi. Retrieved 20 May 2012. ↑ "Spin.com". SPIN. 21 May 2012. Retrieved 27 September 2014. ↑ "Allmusic.com Secret Agent review". AllMusic. Retrieved 27 September 2014. ↑ "Qthemusic.com". News.qthemusic.com. Retrieved 27 September 2014. ↑ "NJ.com". NJ.com. Retrieved 27 September 2014. This page was last changed on 27 March 2019, at 16:25.